There are certain places which are hard to forget since somehow they leave a distinguished imprint on one’s memory. One of these is the island of Asinara which forms part of the territory of Sardinia in Italy. Renowned for its Albino indigenous donkeys from which the name of the island is said to have originated, this particular land is also notorious for its melancholic fate, since it has often been used as a place of seclusion, and was even turned into a penitentiary institution during its last inhabited years. Recently Asinara has been declared as a protected natural reserve and one can only visit it in the company of a licensed guide. Without any more human intervention, the island seems to be turning back to its ancient origins as nature is reclaiming back its rudimental landscape. Tourists who visit the island claim that now this zone has become a delightful gem and yet a previous inhabitant of Asinara questions whether in reality the island has been simply abandoned and left to deal with its own destiny. Surely, a visit to this island will not leave anyone untouched. Asinara is located off the north-western tip of Sardinia. Its territory is about 52 km2 and it belongs to the government. The island of Asinara can be reached by a boat from the nearby coastal village of Stintino which is located in the province of Sassari. Guided tours can take you to visit the island through a selection of means which include bicycles, landrovers, touristic trains, kayaks and boats. Considering the heat and the fact that we were going to spend almost a day on the island, we opted for the comfortable and colourful tourist train that was scheduled to take us to the most prominent areas of the island. The island’s vegetation and climate are typically Mediterranean but on some rocky coastal areas, one can also identify an endemic plant species of Sardinia known as Fiordaliso Spinoso. 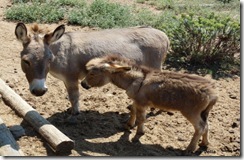 Asinara is also famous for its native Albino donkeys, most of which are regularly observed roaming freely around the island and feeding on shrubs. 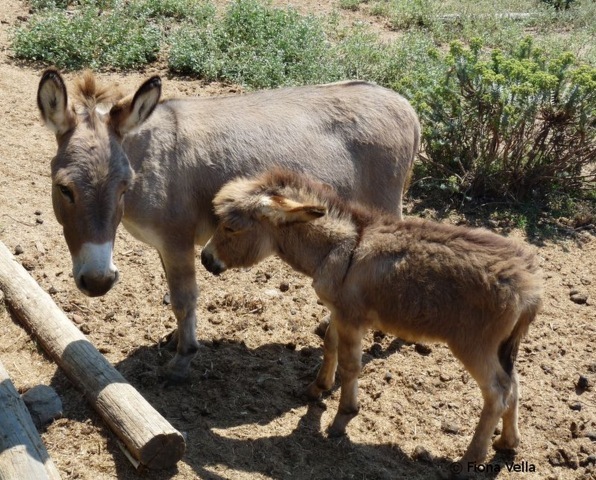 Yet here visitors can also have a glimpse at the typical Sardinian donkey which is generally smaller and has a brownish colour with a black stripe on its back. Other fauna includes wild pigs, sheep, goats and horses; the latter having been liberated on the island by Asinara’s prison guards once the penitentiary institutions were closed down. Traces of human habitation on Asinara go back to prehistoric times as the site of Campu Perdu confirms. Moreover, due to its strategic central position in the Mediterranean, the island has formed part of the history of the Phoenicians, the Greeks and the Romans. Asinara was also habitually frequented by pirates, and a legend narrates that the granite castle which to date dominates the highest point of the island, had served for some time as the residence of the famous Barbarossa. In the 17th century, the island was inhabited by shepherds. However in the 19th century the island became government property and on this land, it was decided to construct a lazaretto for victims of contagious diseases. 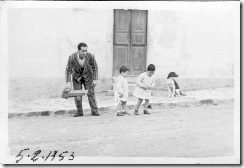 Soon after, Asinara was also selected as a place of exile for a number of prisoners. Eventually, these arrangements led the shepherds to leave the island and most of them formed the nearby village of Stintino on the mainland. During World War 1 Asinara was turned into a prison for about 24,000 Austrian and Hungarian soldiers; 5000 of which died on the island. 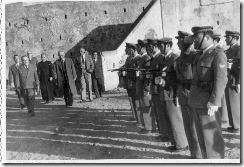 Then, some years later, during the 1970s, the prisons on the island were restructured to become high-security prisons in order to detain within them some of the most dangerous criminals, such as those that formed part of the Brigate Rosse, terrorists, and mafia members; the most infamous of which being Totò Riina. It was on this island too that the magistrates Giovanni Falcone and Paolo Borsellino had resided as part of the security measures that were taken during the prominent trials that were taking place during that period. Finally, in 1997, Asinara was declared as a protected nature reserve and nobody else, except the few guardians who take care of the island, were allowed to live there. A tour around the island will reveal several of the constructions that have once served various functions during Asinara’s history. Some structures have been completely abandoned and are in ruins, whilst others such as the high-security prisons, have been restored as tourist attractions. In these prisons, visitors can experience the conditions in which the prisoners used to live wherein they were always under the supervision of the prison guards. A chamber where the prisoners could take a break from their cells was securely covered by a thick metal net. However this served to provide a view of the beautiful blue sky which though it could have offered some sort of relief, at the same time it probably increased the painful realization of living on such an idyllic island and yet being confined within those punitive walls. In the meantime, although these prisons have been unused for some years now, visitors can’t help reacting when they enter into Totò Riina’s cell. A similar strong emotion is felt on entering the building of the old prison of Fornelli wherein one can also visit the high-security cells whilst also view some old photos of a number of ‘trusted’ prisoners which used to be allowed to work in the fields and to take care of the animals on the island under the guards’ surveillance. 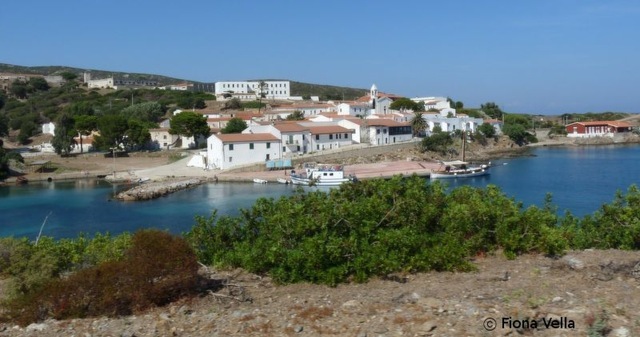 Eventually, visitors were also led to Cala d’Oliva; the small village where Asinara’s workers used to reside. Indeed, 92 year old Franca Fadda Silvetti still remembers the time when she used to live at Cala d’Oliva with her family on Asinara. 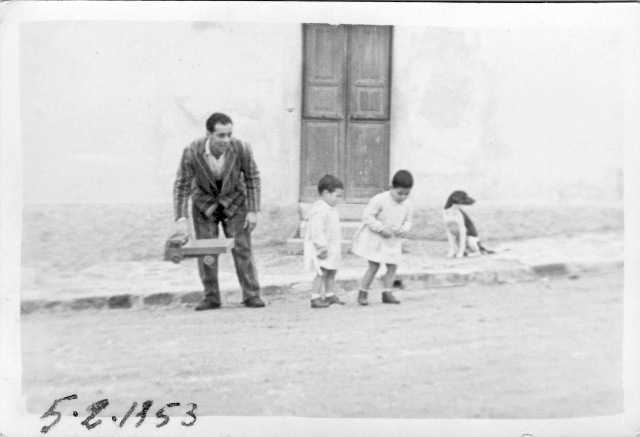 In her autobiographical book ‘La mia Asinara: ricordi di una maestra’, she describes her 33 years residing on this island where her husband Vindice had been appointed as the prisons’ doctor and where she worked as a primary school teacher of the other workers’ young children. 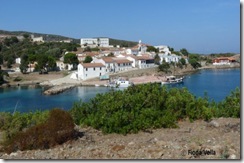 Interestingly, Franca has many positive memories of Asinara even though it was a penitentiary island. When I asked her whether she ever felt afraid or in danger on such a remote place inhabited by prisoners, she adamantly insisted that this was never the case. To make her point, she confirmed that some reliable prisoners were allowed to work outside the prisons during daytime and one of them used to take care of her house and to baby-sit with her young children while she was at work! Now that Franca is widowed, her nostalgic memories of the island’s beautiful environment are even stronger and yet she has never found the courage to return to Asinara from the day when all the island’s inhabitants were ordered to leave the place. Franca wonders whether the decision to leave the island in a state of abandonment was better than having allowed it to remain inhabited by a ‘strange’ population as it was back in 1952 when she put her first steps on that land which had remained so dear to her. She conceded that she decided to write her book in memory of the delightful moments that she and her family have enjoyed on the island so that even today’s readers could get a glimpse of how Asinara used to be. Certainly those who visit Asinara will also get the opportunity to swim in the crystal clear blue sea of three particular beaches which have been selected for the use of tourists. Impressively, various sizeable fish swim confidently among the visitors as if aware that they are protected in this nature reserve. In the background, from time to time, the magnificent silence on the island is pierced by the shrill neighing of Asinara’s donkeys. Once the visit is over and the rented boat takes you away from Asinara, you can easily feel Franca’s nostalgia for this land which can overwhelm you with different sensations. Should you desire a longer stay on this peculiar sanctuary, there is a small restaurant and a basic hostel.